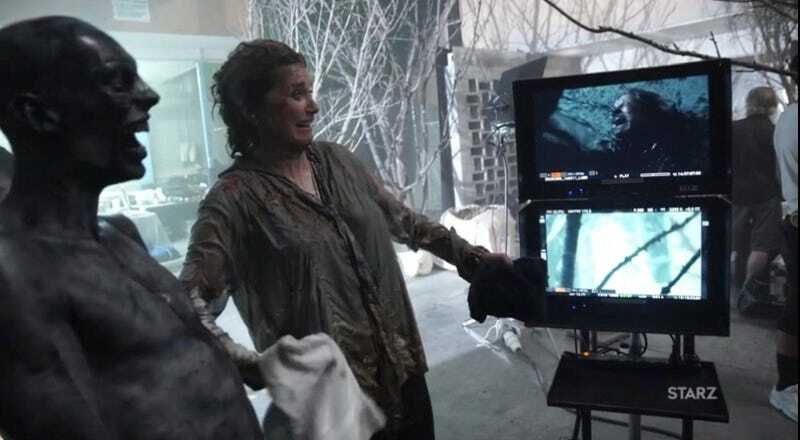 “You’ve never lived until you’ve been hit in the face by a snot cannon,” Lucy Lawless says with deadpan conviction in this brief but fun behind-the-scenes look at Ash vs Evil Dead. This clip shows her character, Ruby, getting absolutely doused with the grossest stuff imaginable—then watching the playback with utter delight. Even better, the actor who plays her demonic spawn is cackling right along with her. Ash vs Evil Dead—which returns Oct. 2 to Starz—looks like the most fun show ever to work on, and Lucy Lawless continues to be the coolest.